Thanks to Kat for another great fix! While this was admittedly slightly 'less-favorite' than my last fix, I still kept it all and have loved wearing three pieces in real life so far. First up was the fabulous Karen Printed Straight Leg Pant from Erica Taylor (regular retail $88). These pants are interesting, and I'm excited to schedule an actual event to wear them to. They aren't really leggings, but are tighter at the top, ending in a straight leg. The pattern is sort of like a red and black houndstooth, but they're textured rather than just printed. They also remind me of my favorite 'old lady' shorts from my fix back in January or February - no zippers or buttons, just pull up. Here, the pants are paired with the Moana Elbow Patch Pullover by RetroD (regular retail $64). 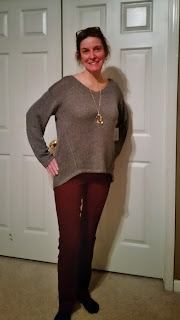 I LOVED the two RetroD sweaters in my last fix and was thrilled to receive another one. This one is a bit looser of a cut/style, and when I wore it the other day I had an annoying issue with it sliding down my shoulder and revealing my bra strap. Ugh. Hopefully I'll get some of the layering turtlenecks on my holiday wish list so I can layer it instead. The accent necklace in this outfit is the Emilia Oval Pendant from Bay to Baubles (regular retail $28). Jewelry isn't my favorite, but the price point made it a definite keep. It does look really nice with this sweater. 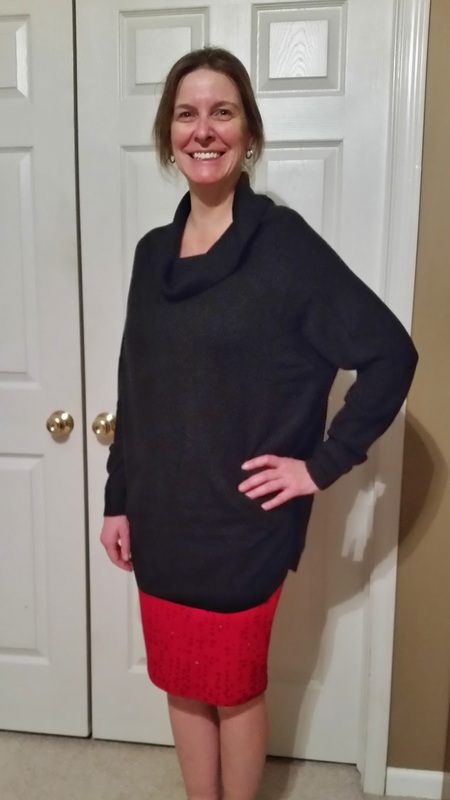 My final piece in this fix was the Goodwin Cowl Neck Sweater by Fate (regular retail $64). I've paired it here with a new LuLaRoe Cassie skirt I won online from SHOP LuLaRoe with Jeannie and Sarah. The sweater was admittedly my least favorite clothing article from my fix, but then I realized it has pockets! I love pockets! The sweater is a super smooth knit that I'm worried will pick up lots of lint and cat-hair, but I haven't worn it in real life yet. Hopefully I'll be pleasantly surprised. I don't usually get my fixes so close together, but I'm happy with everything I received again. 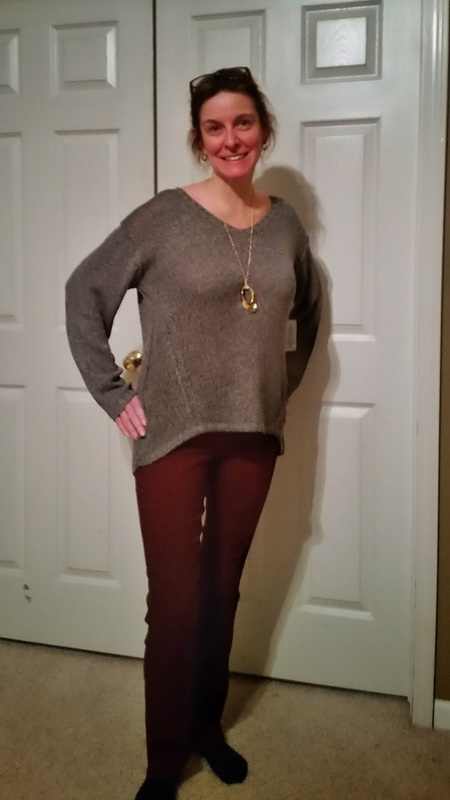 The big holiday contest is what persuaded me to order again so soon - I hope I win some extra Stitch Fix credit! I like the plaid shirt. You look good in anything. Love the plaid shirt. Glad you like the clothes you received. I've never tried Stitch Fix, but sounds like fun! I really like those red pants on you! 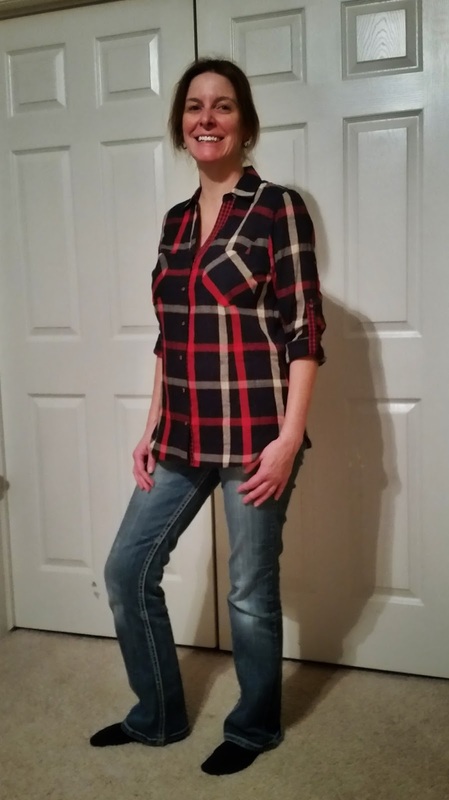 The plaid shirt is a great piece for this time of year, too.